An initial evaluation to determine the extent of a patient's injuries is of critical importance. This evaluation should be followed by an appropriate sequence of emergency diagnostic and therapeutic measures. Relatively little is recorded in the English-language literature on the subject of ipsilateral fracture of the femur and tibia. The complication rate associated with floating knee injuries remains high, regardless of the treatment regimen used. Infection, nonunion, malunion, and stiffness of the knee are all common. These complications can lead to functional impairment and frequently cause unsatisfactory results. Floating knee injuries may include a combination of diaphyseal, metaphyseal, and intra-articular fractures (see the image below). This combination of fractures is less common in the pediatric population than in adults. However, epiphyseal injury can adversely affect open growth plates, predisposing a child to limb-length discrepancy and angular deformities. 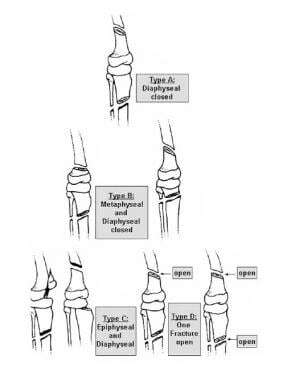 Fraser classification of floating knee injuries. 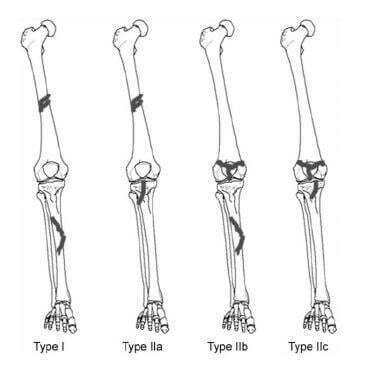 In both of these classification systems , type II fractures with intra-articular involvement have been linked with higher complication rates and poorer functional results than those observed with type I injuries. In children, floating knee injuries are classified according to the Bohn-Durbin or Letts classification systems. The Bohn-Durbin system does not account for open fractures and cannot be used to predict complications and prognoses. Unacceptable findings are femoral union in a position of greater than 30° anterior angulation, 15° valgus angulation, and 5° posterior or varus angulation, or greater than 2 cm of shortening. Tibial malunion is defined as greater than 5° angulation in any plane or greater than 1 cm of shortening. Rotational malunion is defined as any internal rotational deformity exceeding findings on the unaffected side or greater than 20° external rotation of the extremity, as detected during walking or standing. Letts and Vincent classification system for floating knee injuries in children. Road traffic accidents are the most common mechanisms of trauma, followed by gunshot wounds and falls from heights. This severe injury appears to be increasing in frequency. A male preponderance is observed, particularly in young adults 20-30 years of age. 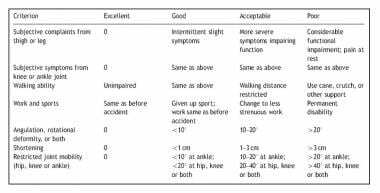 Karlstrom and Olerud's criteria for assessing functional outcomes after a floating knee injury. Good-to-excellent results have been reported with both conservative and surgical methods in children. Fixation of one or two fractures in children aged 9 years or younger offers superior results and minimizes the incidence of long-term dysfunction of the extremity. Regarding intra-articular (type II) injuries, good or excellent results are reported in 24% of patients. The difficulty in obtaining satisfactory function after type II injuries may result from severe injuries to the soft tissue, damage to the knee joint, and/or the complexities of achieving stable reconstruction. Muñoz Vives J, Bel JC, Capel Agundez A, Chana Rodríguez F, Palomo Traver J, Schultz-Larsen M, et al. The floating knee: a review on ipsilateral femoral and tibial fractures. EFORT Open Rev. 2016 Nov. 1 (11):375-382. [Medline]. Blake R, McBryde Jr A. The floating knee: ipsilateral fractures of the tibia and femur. South Med J. 1975 Jan. 68(1):13-16. [Medline]. Eone DH, Lamah L, Bayiha JE, Ondoa DL, Nonga BN, Ibrahima F, et al. [Assessment of concomitant floating knees injuries severity]. Pan Afr Med J. 2016. 25:83. [Medline]. Rethnam U, Yesupalan RS, Nair R. Impact of associated injuries in the floating knee: a retrospective study. BMC Musculoskelet Disord. 2009 Jan 14. 10:7. [Medline]. [Full Text]. Hung SH, Lu YM, Huang HT, Lin YK, Chang JK, Chen JC, et al. Surgical treatment of type II floating knee: comparisons of the results of type IIA and type IIB floating knee. Knee Surg Sports Traumatol Arthrosc. 2007 May. 15(5):578-86. [Medline]. [Full Text]. Fraser RD, Hunter GA, Waddell JP. Ipsilateral fracture of the femur and tibia. J Bone Joint Surg Br. 1978 Nov. 60-B(4):510-5. [Medline]. Letts M, Vincent N, Gouw G. The "floating knee" in children. J Bone Joint Surg Br. 1986 May. 68(3):442-6. [Medline]. [Full Text]. Karlström G, Olerud S. Ipsilateral fracture of the femur and tibia. J Bone Joint Surg Am. 1977 Mar. 59(2):240-3. [Medline]. Rethnam U, Yesupalan RS, Nair R. The floating knee: epidemiology, prognostic indicators & outcome following surgical management. J Trauma Manag Outcomes. 2007 Nov 26. 1(1):2. [Medline]. Yokoyama K, Nakamura T, Shindo M, et al. Contributing factors influencing the functional outcome of floating knee injuries. Am J Orthop. 2000 Sep. 29(9):721-9. [Medline]. Kao FC, Tu YK, Hsu KY, Su JY, Yen CY, Chou MC. Floating knee injuries: a high complication rate. Orthopedics. 2010 Jan. 33(1):14. [Medline]. Shahzad K, Ahmad Khan RD, Yasin A. Floating knee injuries: postoperative complications and outcome. J Pak Med Assoc. 2015 Nov. 65 (11 Suppl 3):S195-201. [Medline]. Yue JJ, Churchill RS, Cooperman DR, et al. The floating knee in the pediatric patient. Nonoperative versus operative stabilization. Clin Orthop Relat Res. 2000 Jul. (376):124-36. [Medline]. Van Raay JJ, Raaymakers EL, Dupree HW. Knee ligament injuries combined with ipsilateral tibial and femoral diaphyseal fractures: the "floating knee". Arch Orthop Trauma Surg. 1991. 110(2):75-7. [Medline]. Chalidis B, Metha SS, Tsiridis E, Giannoudis PV. Mini-symposium: management of fractures around the knee joint. (ii) The "floating knee" in adults and children. Curr Orthop. 2006 Dec. 20(6):405-10. [Full Text]. Dwyer AJ, Paul R, Mam MK, et al. Floating knee injuries: long-term results of four treatment methods. Int Orthop. 2005 Oct. 29(5):314-8. [Medline]. Ostrum RF. Treatment of floating knee injuries through a single percutaneous approach. Clin Orthop Relat Res. 2000 Jun. (375):43-50. [Medline]. Ríos JA, Ho-Fung V, Ramírez N, Hernández RA. Floating knee injuries treated with single-incision technique versus traditional antegrade femur fixation: a comparative study. Am J Orthop. 2004 Sep. 33(9):468-72. [Medline]. Elmrini A, Elibrahimi A, Agoumi O, Boutayeb F, Mahfoud M, Elbardouni A, et al. Ipsilateral fractures of tibia and femur or floating knee. Int Orthop. 2006 Oct. 30(5):325-8. [Medline]. Gao K, Gao W, Li F, Tao J, Huang J, Li H, et al. Treatment of ipsilateral concomitant fractures of proximal extra capsular and distal femur. Injury. 2011 Jul. 42(7):675-81. [Medline]. Hee HT, Wong HP, Low YP, Myers L. Predictors of outcome of floating knee injuries in adults: 89 patients followed for 2-12 years. Acta Orthop Scand. 2001 Aug. 72(4):385-94. [Medline]. 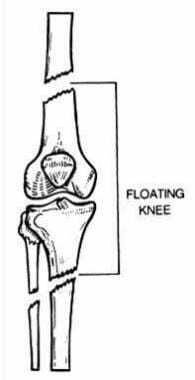 Treatment protocol for floating knee injuries. Ex-Fix = external fixation; IM = intramedullary; ORIF = open reduction and internal fixation. Positioning for surgery to treat a floating knee injury. Conservative management of the femur in an ipsilateral injury of this type is likely to result in malunion of the femoral fracture and shortening. Early joint mobilization determines the patient's functional outcome after treatment of floating knee injuries. Nailing of both the tibial and the femoral fractures, as shown, is the best method for enabling early mobilization.